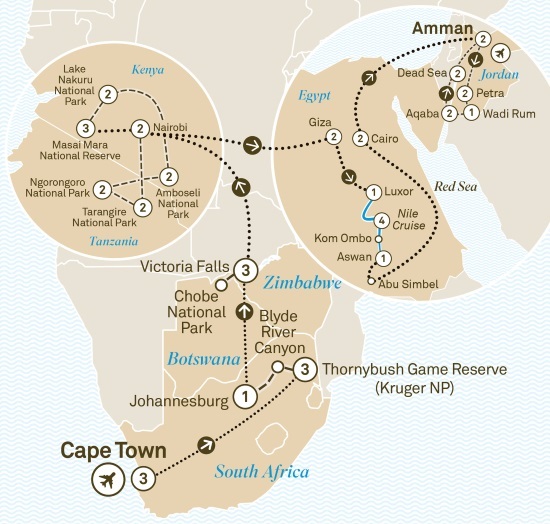 Bid farewell to Southern Africa as you fly from Nairobi to Cairo. At Giza enjoy a two night Special Stay, where you’ll be able to soak up the magnificent view of the Great Pyramids right from your balcony. Freechoice: Cruise and snorkel the Red Sea in search for marine life. Alternatively, you may choose a relaxing Spa treatment. If you close your eyes and picture Africa, Egypt or Jordan, chances are you’ve conjured up one of the standout attractions in this itinerary. We’ve combined the highlights of these remarkable places in one complete, wonder-filled package. First, you’ll immerse yourself in Africa, from the emerald-green hills of Cape Town and majestic Victoria Falls, to tree-climbing lions in Tanzania. Next, you’ll discover Egypt and Jordan, swapping lush greens for golden sands, rose-red canyons and ancient wonders. Along the way, your journey will be peppered with unique experiences you won’t find anywhere else. Drive to Tarangire N. P.